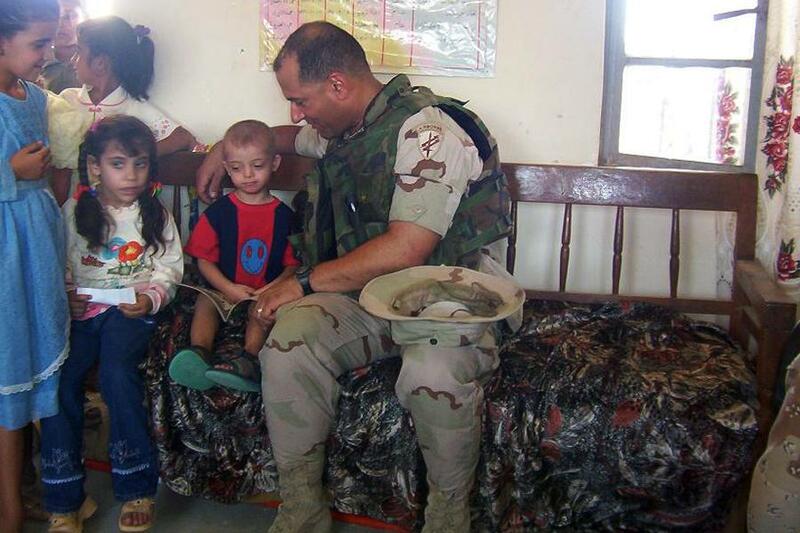 Major Luis Hernandez reads a book in English to an Iraqi child, who told the story back to Hernandez in Farsi, at an elementary school in Diwaniyah, Iraq. “I really missed my own kids after that day was over,” Hernandez said. Hernandez was part of the 413th Civil Affairs Battalion and assessed and rebuilt schools, roads, medical clinics, water treatment facilities and hospitals while in central and southern Iraq. Hernandez served for 24 years in the Army Reserve and is a Veteran of Desert Storm and Iraqi Freedom. Hernandez is the assistant band director of the Soaring Pride Band. Clarinet in one hand, his notice in the other. A heavy decision to make. He grasps both tightly as he takes his next step in life. Assistant band director Luis Hernandez served for 24 years in the Army Reserve and as a Veteran of Desert Storm and Iraqi Freedom. After completing military police training, Hernandez was put into Signal Corps. Hernandez stayed in Signal Corps for two years until switching over to civil affairs. Hernandez said his experience taught him the value of being grateful. Hernandez also said it made him appreciate his friends and family.